No matter how you hype them, a reusable bag is a reusable bag. Picnica’s lightweight nylon tote, however, transforms into an adorable stuffed rabbit when it’s not in use. Distract a fidgety tot with the bunny while you’re cruising along the supermarket aisle, then unzip its back at the cash register to enlist ol’ Bugs in some heavy lifting. No matter how you hype them, a reusable bag is a reusable bag. 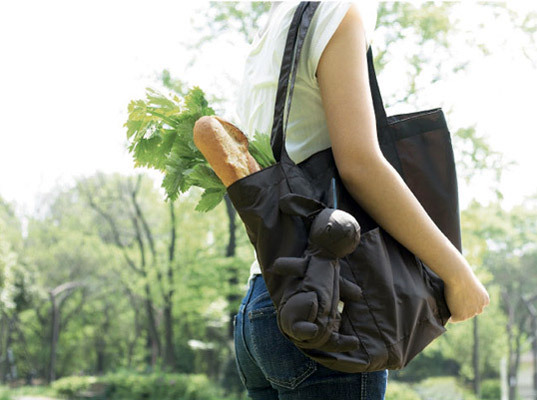 Picnica's lightweight nylon tote, however, transforms into an adorable stuffed rabbit when it's not in use. Distract a fidgety tot with the bunny while you're cruising along the supermarket aisle, then unzip its back at the cash register to enlist ol' Bugs in some heavy lifting.